The spiritual culture of the people has its roots in the land. The diversity of Kaohsiung is not only reflected in its ethnicity and food but also in religion. Many different religions such as Buddhism, Taoism, Catholicism and I-Kuan Tao have made Kaohsiung their home. The different religions between the city and the countryside have seen Greater Kaohsiung earn the title of being the "United Nations of Religion". Why not stop by for some spiritual networking? Kaohsiung's downtown areas are a bustle of urban activity where life proceeds at a hectic place. Nevertheless there are many places in the city that provide a quiet, contemplative space but also offer unique sights well worth visiting. In the Cianjin District, follow busy Wufu Rd. towards the Love River and the atmosphere becomes more quiet and relaxed. Near the mouth of the Love River, the spire of the Rose Basilica rises into the sky next to the Kaohsiung Bridge, looking out over the changing face of the city as the river of time flows by. The first Catholic Church in Taiwan appeared on the banks of the Love River in 1859. More than a century later, Kaohsiung has grown from a riverside farming village into a grand metropolis filled with towers and apartment blocks. The church has also been expanded from the original straw hut into the current Gothic church. Known as the most beautiful church in Taiwan, the European spire, arches and glass windows always impress the first-time visitor. It is not just the church's exterior that has been preserved for over a century. 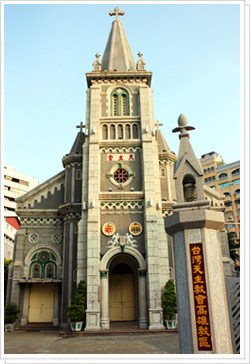 The Rose Basilica is a treasure house of Taiwanese Catholic relics as well. The registry of baptisms kept here, for example, is the oldest baptism registry in Taiwan. Since the first baptism recorded on November 3, 1859, over 10,000 people have been baptized here. The statute of Mary over the central altar was also shipped all the way from Spain to Kaohsiung in 1863 when the basilica was first built and is now over 140 years old. There are many other historical relics in the basilica. The church staff are more than happy to chat to visitors and give them a guided tour of the basilica's history and architectural features. As the traveler's search for inner peace winds its way north, they come to the Jing Si Hall on Heti S. Rd. between Zihyou Rd. and Dashun Rd. in Samin District. The minimalist gray exterior imbues the massive Chinese-style building with a sense of strength and reserve. 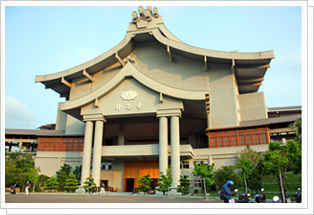 The Tzu Chi Foundation has supporters all across the world and Jing Si Hall is its main base in Kaohsiung. 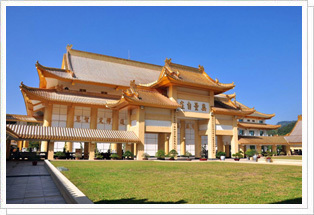 The hall also serves as Tzu Chi's center for promoting charitable activities in southern Taiwan. 1F is open at anytime to members of the public seeking a place for quiet contemplation. Before entering Jing Sih Hall, remove your dusty shoes and seal them inside the shoe bags at the door. Inside, you find a spotless grand hall filled with the heady scent of wood and incense. There is just something about the polished wooden floor and antique bronze Buddha statue in the front of the Jing Sih Hall that makes people walk softly and speak in a low whisper. Walk along the hall on the left of the hall and travelers will find the Jing Sih Library. The Buddhist books arranged on the shelves as well as the garden around the pond and corridors make this a perfect place to relax and enjoy a cup of tea. 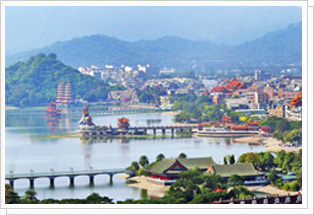 Lotus Lake in Zuoying has the highest density of temples in Kaohsiung. There are more than twenty temples here with most concentrated on the west side, so the air is always filled with the smell of burning incense and gold paper. When travelers visit Lotus Lake, their gaze naturally settle on the colorful temples, large statues, and dragon and tiger towers that dot the landscape. They are then drawn naturally into the flow of people between the temples. For new visitors or experienced pilgrims, it has become a tradition to enter the dragon mouth of the Dragon Tower and then come out through the tiger mouth of the Tiger Tower in the hopes of enjoying good luck by "Entering the dragon's belly and escaping the tiger's maw". Many of the lakeside temples have a long history. Ciming Hall, Yuandi Temple and Cihji Temple, for example, were founded during the reign of Kangsi in the Qing Dynasty. These have a strong following and many believers come to offer incense, give offerings in thanks and ask for an augury. Visitors should try casting the auguries as part of the folk experience. 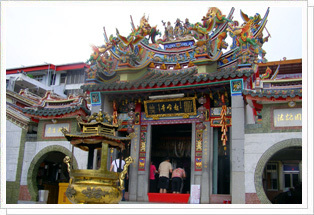 The Sanshan Guowang Temple is a testament to Hakka settlement in Taiwan. In the early years, Hakka from Guangdong settled in the area and brought their gods with them from their homeland to watch over the perilous tasks of taming the wilderness. Once life settled down and the people had money to spare, they began building temples to their hometown gods. 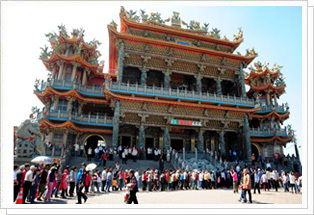 The Sanshan Guowang Temple is the focus of religious belief and a part of the local heritage. 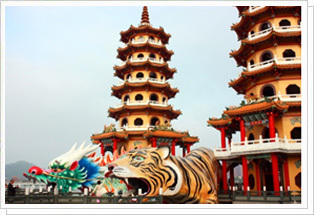 There are a number of Sanshan Guowang Temples throughout Kaohsiung. The most unusual of these are the Sanshan Guowang Temples in Ciaotou District. The three kings each have their own temple in Sinjhuang Borough, Sande Borough and Jioujiawei's Jianan Borough. The Sinjhuang Yishan Temple is dedicated to the First King, Jioujiawei's Yishan Temple is dedicated to the Second King and Sande's Sanshan Guowang Temple is dedicated to the Third King. The Jioujiawei Yishan Temple is the largest of the three and the sight of a large temple among the open plains in rustic Ciaotou District makes for quite an impressive sight. The Jioujiawei Yishan Temple has been watching over the surrounding countryside for more than three centuries since 1668 during the Qing Dynasty. The original temple has long been worn down by time. The last reconstruction was carried in 2002 and the rebuilt Yishan Temple now covers 500-ping with a main hall 33 meters high, making it the largest Sanwang Guowang Temple in Southeast Asia. 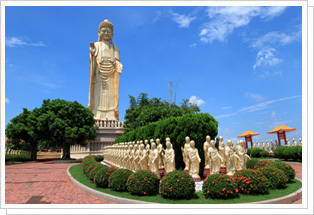 The hills of Dagang Mountain and Dashu near Kaohsiung City are famous as sites sacred to Buddhism. From Dagang Mountain, it is possible to look out over the plains of Greater Kaohsiung. There are more than ten old temples here including Caofeng Temple, Lianfeng Temple and Longhu Monastery, earning the area the title of "Taiwan's Buddha Mountain". Bodhi trees are planted all along the roads leading into the mountain, welcoming visitors to this hallowed land. 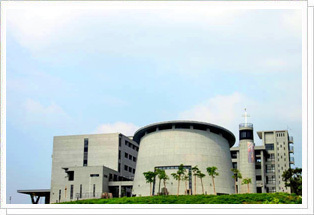 There two large, extensively developed religious campuses in the mountains of Kaohsiung. The Shenwei Tiantai Shrine of I-Kuan Tao in Sinliao Borough, Liugui, and the Catholic Beatitudes in Shanlin District. Both are practically the biggest of their kind in Taiwan and even the world based on the size of the site and architecture. 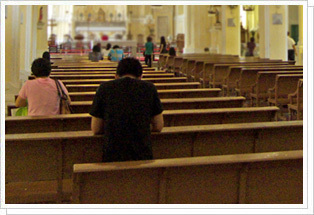 For visitors, they offer an unusual opportunity to experience religious culture. As you follow the road in Liugui's Sinliao Borough, a building that can only be described as "magnificent" appears out of the woods. The entire shrine is built in the traditional Chinese palace architectural style with a front, central and rear hall. Each hall is dedicated to the different deities worshipped by I-Kuan Tao. The most striking aspects of the shrine are the extensive use of gold paint inside and outside the building, the grand architecture as well as the well-maintained gardens that give this golden shrine a solemn atmosphere. The Catholic Church's Beatitudes cultural center in Shanlin District is quite different from the solemn mood at Tiantai Mountain. The center was built as a part of the World 100 Project proposed by Pope John Paul II and upon its completion in 2010, it became a campus for believers to share their experiences in social services and proselytizing. The multi-purpose campus includes a retirement home, orphanage and Catholic Museum. The grounds feature a pilgrim's road, a dedicated venue for reciting the rosemaries, a chapel for prayer, a lawn for children to run and play as well as trails to explore the woods. Traveler accommodation is available to help promote tourism in Shanlin District.